If you’ve been on the Internet within the past few weeks, you may have noticed the term “Mobilegeddon” pop up once or twice, possibly even more. But what is “Mobilegeddon” and why are marketers and business owners freaking out over it? In this blog post, we’ll break it down for you – What “Mobilegeddon” is, why you should care as a business owner and how you can prepare your website for what’s to come. On February 26, Google announced that on April 21, the dominant search engine would be expanding its use of mobile-friendliness as a ranking signal. This means that mobile-friendly websites will begin to rank higher in Google search results once the update goes into effect. Webmasters, consultants and journalists have warned that websites that haven’t been updated to reflect this change will rank lower on Google searches, which can have negative consequences for your overall business. It shouldn’t be a surprise when you hear that Google dominates Internet search in the United States. In January, Google led desktop search with a 64.4 percent share, according to online researcher comScore. In March, Google held 84.1 percent of the U.S. mobile and tablet search market, according to StatCounter Global Stats. With over 60% of Google searches being conducted from mobile devices, it only makes sense that their algorithms adapt to these usage patterns. 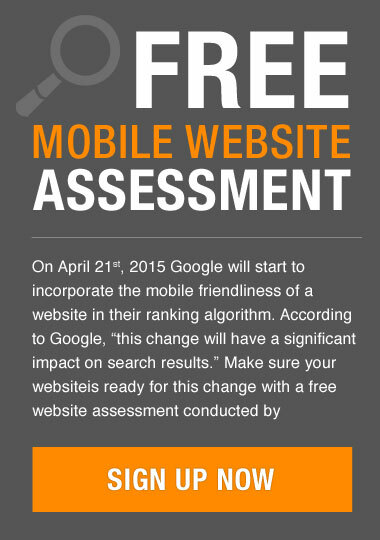 Along with its announcement, Google released a mobile friendly test page, where business owners can check to see if their site is mobile ready. If your website is not prepared, you should consider investing in an update to a responsive design to make your content adaptable to different viewing formats. At Brainstorm, we specialize in designing mobile and responsive websites that function seamlessly across a variety of devices. Contact us today and let us put our passion, talents and commitment to work for you.